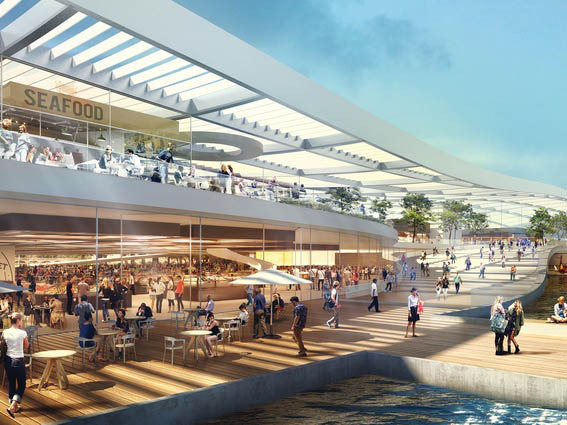 The redesign of Sydney Fish Market may be much-anticipated by tenants and patrons alike, but if shareholders can't agree on who has the right to redevelop the site, there may not be a new site at all. In 2016 it was announced that the fish market would be relocated to a site around the corner at Blackwattle Bay, with the current site being turned into a residential. Then in 2017 the design tender for the new market was awarded to Danish architecture firm, 3XN, along with Sydney firms BVN and Aspect Studios. Now, former premier Nick Greiner, who propelled the market into privatisation in 1994, is being pulled in to help create a smooth transition for the market’s relocation while the former site is developed into thousands of new apartments. One of the biggest issues is current tenants’ reluctance to voluntarily end their tenancy and commit to a new location.The other issue is the continued attempts to persuade the market’s owners and tenants to take on the daunting task of redeveloping the site themselves. These issues are complicated by the market’s complex ownership structure. Sydney Fish Market, which holds a lease to the Pyrmont site from the government, is owned by the Catcher’s Trust (which represents fisheries) and the Sydney Fish Market Tenants & Merchants. The current understanding is that Sydney Fish Market has the exclusive right to develop the area, as per the lease signed in 1994. There are restrictions around who can be considered part of Sydney Fish Market however, which has led to an expensive legal battle with entrepreneur Dominic Galati, who argues that as a shareholder in one of the tenants he should have more influence over the market. Currently, the process of securing agreement from shareholders is not yet complete, endangering the plan for a new Sydney Fish Market by 2023.